Pancreatic cancer is one of the most lethal forms of cancer but in most cases the cause is still unknown. The most common type of pancreatic cancer is pancreatic ductal adenocarcinoma (PDAC), which accounts for 90% of cases. As many patients are not diagnosed until the cancer is advanced, only very few patients are cured. Currently the only way to cure PDAC is with surgery, but the cancer often returns. Unlike most other cancers, the rate of pancreatic cancer is actually increasing. No one knows why. For more information on pancreatic cancer, please visit the BC Cancer Agency Website and HealthLink BC. We know very little about the risk factors for pancreatic cancer. If you smoke or have a family history of specific types of cancer, you may have a higher risk of developing pancreatic cancer. Smoking has been shown to increase pancreatic cancer risk. However, although smoking rates have decreased in recent years, we have not seen a corresponding decline in the number of people that develop pancreatic cancer. We know that some pancreatic cancer is hereditary because it is more common in some families. Pancreatic cancer is also associated with some inherited cancer syndromes, including BRCA2, LKB1/STK11 (Peutz-Jeghers syndrome), CDKN2A (Familial atypical multiple mole melanoma syndrome), PALB2 and MMR (hereditary nonpolyposis colorectal cancer). As we know little about specific risk factors for pancreatic cancer, it makes screening very difficult. Looking for ways to detect pancreatic cancer as early as possible is a major focus of our research. In the future, we hope to be able to offer a screening test based on imaging (similar to the use of mammography for breast cancer) or a biomarker (blood) test. The incidence of pancreatic cancer is higher in people who have or had chronic pancreatitis (inflammation that causes irreversible damage to the pancreas). For more information, please visit the Canadian Cancer Statistics website. Pancreatic cancer is difficult to diagnose at an early stage because there are often no definitive symptoms until the cancer has advanced. More information about signs and symptoms can be found on the BC Cancer Agency website or the Canadian Cancer Society website. If one or more of the signs and symptoms described here is present, certain exams and tests may be done to find out whether they are caused by pancreatic cancer or by some other disease or illness. Diagnosis is the process of finding the underlying cause of a health problem. If pancreatic cancer is suspected, the healthcare team will confirm if it is present or not. These include computed tomography (CT scan), endoscopic ultrasound (EUS) and endoscopic retrograde cholangiopancreatography (ERCP). More information about these imagine techniques can be found at Health Links BC. While imaging techniques may show a mass within the pancreas, only direct examination of the pancreatic tissue allows for the definitive diagnosis of cancer. The tissue samples may be obtained in two different ways. The first is by a fine needle biopsy carried out during a procedure using an endoscope. 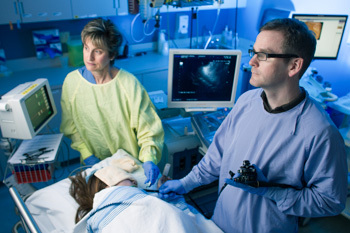 The second involves taking tissue directly during diagnostic abdominal surgery. 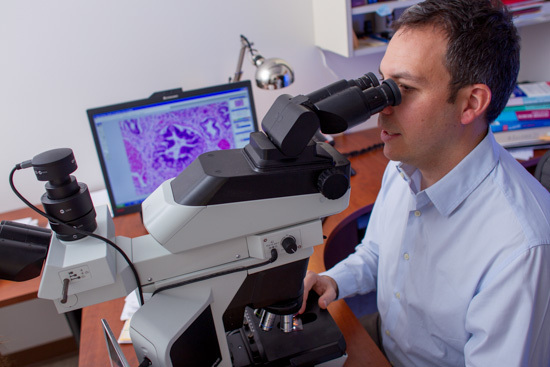 The tissue samples that are collected during biopsy may be sent to the BC Gastrointestinal and Pancreatic Biobank to help with research. Benign tumours are non-cancerious growths that do not spread to other parts of the body and are usually not life-threatening. Examples are pancreatic pseudocysts and serous cystadenoma. Precancerous tumours may develop into cancer. Some examples are mucinous cystic neoplasms and intraductal papillary mucinous neoplasms (IPMNs). More than 90 per cent of pancreatic cancers are the first type, adenocarcinomas (PDAC), cancers that develop within the pancreatic ducts that carry digestive enzymes. Patients with this type of cancer often have non-specific signs and symptoms. Symptoms may include pain, weight loss or jaundice (yellowing of the skin). Another, although much less frequent solid tumour of the pancreas, is the mucinous cystadenocarcinoma (MCN). These tumours have a better prognosis than PDAC. A common precursor lesion to MCN is called an intraductal papillary mucinous neoplasm (IPMN), which usually grows along the pancreatic duct causing sometimes obstructive symptoms. These are very important to recognize because they represent a potentially curable precursor lesion to invasive pancreatic cancer. Pancreatic neuroendocrine tumors (pNET), also referred to as endocrine pancreatic cancer, are much less frequent than non-endocrine cancers within the pancreas. Since they can produce highly active hormones they may present with very dramatic symptoms such as high sugars, a severe skin rash, severe diarrhea, or hot flashes. Please see the BC Cancer Agency website for more information about diagnosis. Treatment options are limited for patients diagnosed with pancreatic cancer. Those whose cancer is detected earliest have the most options. For more information about surgical procedures, please read these resources provided by Vancouver Coastal Health. As pancreatic cancer is often diagnosed when it is already advanced, surgery is not an option for some patients. Chemotherapy (the use of anti-cancer drugs) is generally given after surgery to prevent cancer recurrence. It is also used for patients who are unable to have surgery because the cancer has grown into the neighboring blood vessels or spread to other organs. 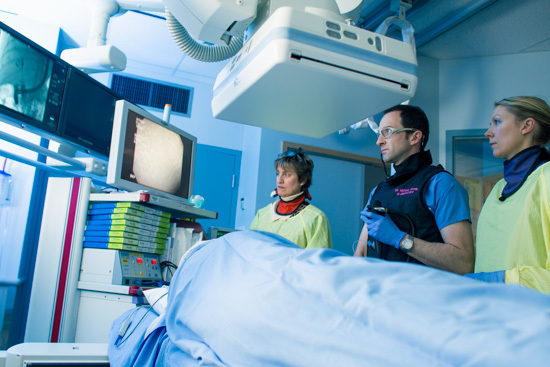 Radiation Treatment is occasionally used to treat pancreatic cancer when the tumour cannot be removed with surgery, but has not spread to other organs. Please see the BC Cancer Agency website for more information about treatment. The next Pancreatic Cancer Education Day is planned for December 2, 2017 in Vancouver. Check the ‘News and Events’ section of this website for upcoming events.